Dual internally-fanned 70, 71, 712-Series alternators truly bridge the gap between gasoline and diesel engines by combining the high-output and superior low cut-in characteristics of our premium small case alternators with a sealed construction that meets international ISO and SAE standards, as well as USCG standards for ignition protection. 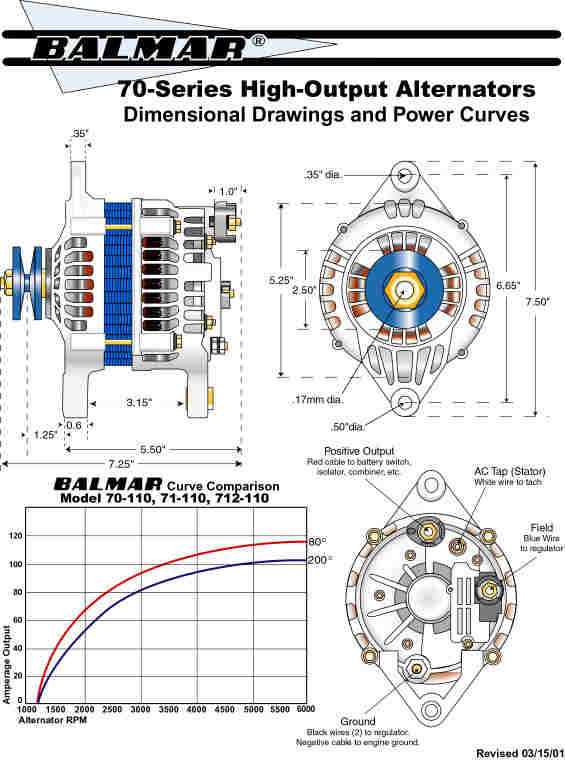 With an impressive top-end rotor speed of 12,000 r.p.m., this new alternator is an ideal choice for Mercruisers and other high-performance marine engines with cruising speeds meeting or exceeding 5000 r.p.m. Available in 1'' (71-Series), 2'' (712-Series) single-foot, and dual-foot (3.15"ID) saddle-style mounts. 2.5" x single deep vee pulley is standard. Available in 50, 65, or 100-amp outputs, 80-Series alternators are constructed to meet the specific demands of sport fishers, sport cruisers and trailer boats. All 80-Series alternators feature isolated grounds, sealed brushes and comply with USCG, SAE J1171, and ISO 8846 standards for gasoline or diesel engines. Available in 1'' (81-Series) or 2'' (812-Series) single-foot mounts.2.5" x single deep vee pulley is standard. True marine construction and an impressive output at lower engine rpms consistent with diesel engines have made our small-case alternators favorites among recreational and commercial boaters. Available in 75, 100, and 150-amp single and dual outputs, these alternators feature heavy-duty internal components and durable powder-coat finishes for years of reliable offshore service. Three mounting styles: 1'' (91-Series), 2'' single-foot (912-Series), and 3.15'' (90-Series) dual-foot models are compatible with a wide range of marine engine types. Some specific applications, such as Perkins-Volvo, Lehman Sabre, and other engines using some Lucas-type alternators may require the use of our 901-Series alternators with an offset tensioning arm (see dimensional drawings and curves under 90-Series Alternators). 2.5" x single deep vee pulley is standard on 75 and 100-amp models. 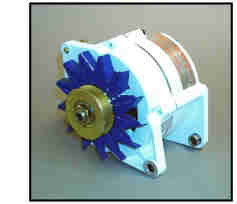 150-amp models feature 2.5" x dual deep vee pulleys.